Beat eggs in a bowl and add salt to taste. Heat oil in a skillet or wok and pour in half the egg mixture. Allow the contents of the skillet to cook over medium heat into a single, golden-brown, thin sheet of egg, turning over to ensure that both sides are cooked. Repeat once again with the remainder of the egg mixture. Cut the two sheets of cooked egg into thin strips. 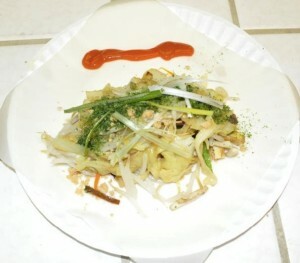 Stir fry the following items for the filling separately and place into dishes: the bean sprouts, cabbage, snow peas with carrots, and baked bean curd. Add salt as desired for flavor. 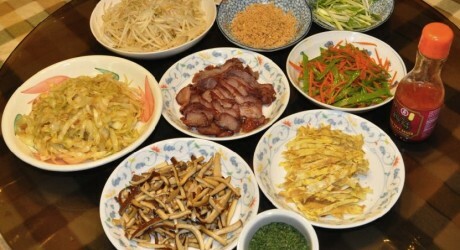 Arrange the ingredients, including the stir-fried items, barbecue pork, peanut powder, chili sauce and egg strips, as well as optional items such as shredded green onions and seaweed powder, on a table for easy access and preparation. 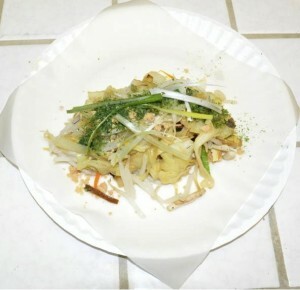 Place a spring roll wrapper on a large, flat plate as shown in the photo below. 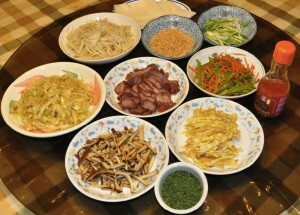 Layer the items in the following order: dry ingredients first (such as peanut powder or egg strips), followed by the pork, the stir-fried vegetables, and finally some of the dried ingredients once again as desired. 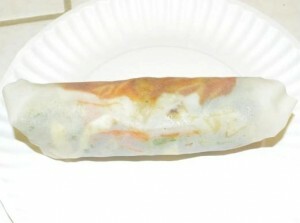 This will prevent the moisture from causing the spring roll wrapper to break. 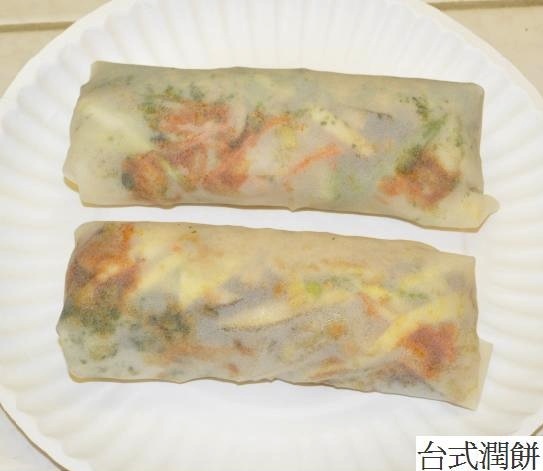 Use the chili sauce to lightly moisten the edges of the wrapper and wrap the spring roll as indicated below. 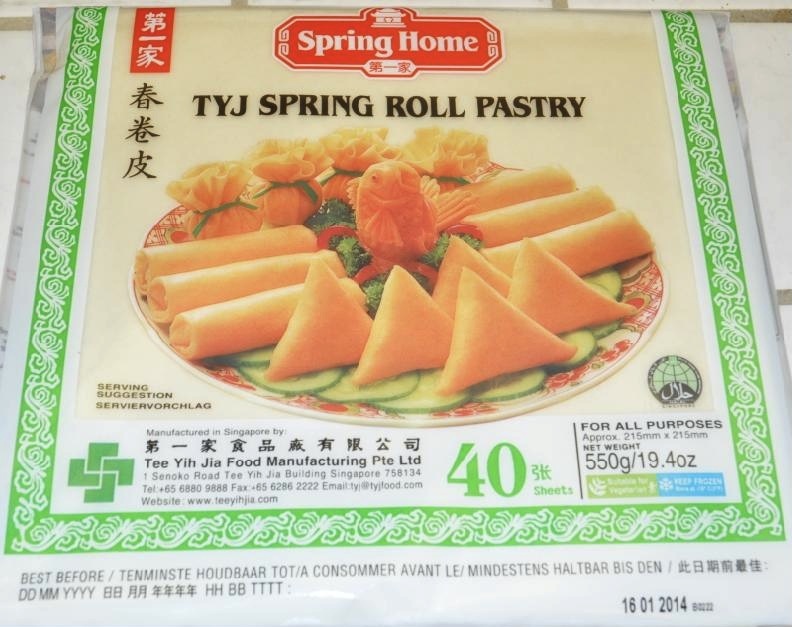 You can find these in the frozen department at Asian grocery stores or order online.